Most of us have at least a vague idea of what SEO is. But not many of us have a real clear picture of what successful SEO requires. SEO stands for search engine optimization. It has to do with the search queries typed (or spoken) by users, and how the search engines (Google, Bing, etc.) rank all the billions of web pages out there to pull up the best ones for that query. Organic search is huge. Organic search is when one of your pages, posts or articles is found through a search query. Up to 64% of the traffic coming to your site is organic. So SEO is important! But how the search engines rank pages has changed drastically over the past 10-15 years, and especially the past 6 years. That’s because Google—the undisputed King of search—keeps changing its algorithms to give searchers the best possible results for their queries. Their goal has always been to get those most important pages to the top of any search query. But they realized a lot of web developers were trying to game the system by doing things like keyword stuffing (adding keywords by the dozens in hopes of rising to the top). These practices were getting their pages ranked high, but weren’t helping the searcher at all. So Google took action. The Panda Update was Google’s third major update to stick to their goal of finding, indexing and ranking the very best search results for organic queries. It was introduced in 2011, and has to do with content quality. Keyword stuffing had already been penalized for some years by this time. But Panda helped prevent pages with poor quality content from ranking at the top in searches. Google wants the best content for any specific query to rank the highest. WHAT PANDA MEANS FOR YOU: Write an ongoing stream of quality content for your audience, which will give Google a reason to rank you higher. One of the factors Google uses to rank a site is the number of backlinks it has —outside links that point to that site. Of course many got into the practice of buying and trading links to up their SEO. So Google launched the Penguin Update in 2012 to penalize “unnatural” link building. Penguin rewards sites that have natural backlinks from high-quality websites and other legit sources. 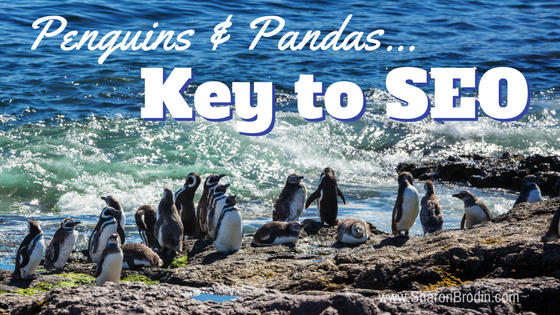 WHAT PENGUIN MEANS FOR YOU: The better your content, the more reason for others to link to that content, giving Google a reason to rank you higher. Hummingbird, launched in 2013, wasn’t just an update but a completely different algorithm. The biggest difference is that Google moved beyond keywords to natural language search. Hummingbird recognizes synonyms and different phrases that mean the same thing. You still need to know the language of your audience, but you don’t have to use the same keywords over and over again. That means more natural writing. WHAT HUMMINGBIRD MEANS FOR YOU: Write for your audience, using the language your audience uses. Google gets it. A great place to learn more is the source: Google publishes this Search Engine Optimization Starter Guide. It’s a free PDF download. The Guide is a straightforward and easy-to-understand primer in good SEO. Just like it takes time and effort to build a successful business or non-profit, it takes time and effort to develop successful SEO. Are You Marketing to Your Most Valuable Audience?